What a great way to celebrate your birthday! A Lincoln Casino player decided to play some slots on her birthday recently and she ended up winning over $50,000! And get this -- it was her very first visit to that casino. Laura D had just signed up at Lincoln Casino. She wandered around the casino at first, browsing the hundeds of games from WGS that they have. She tried a few games but then settled in on the horse racing-themed Win Place or Show slot. She started off betting two coins but when she won $5 she decided to increase to the maximum of three coins. Almost immediately she got three Gold Cup symbols which won the accumulated progressive jackpot of $51,789. Win Place or Show online slot pays $50,789 progressive jackpot. "I'm surprised the neighbours haven't complained,” the excited winner told a Lincoln Casino customer service representative. “It was quite late at night and my scream of delight once I realized what had happened must have woken up half the neighborhood. I can't imagine what they must have thought!" "I’m going to put a lump sum on the mortgage,” she said. “And pay for a trip for my husband and I, maybe Hawaii!" "Win, Place or Show? I’ll take Win anyday!” laughed Lincoln Casino manager Ryan Wilson. “We’re delighted for Laura. I'm sure she'll remember this birthday for many years to come!" 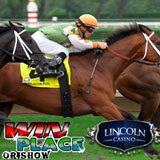 Win Place or Show is just one of the jackpot games at Lincoln Casino. Mega-Money Mine, Pay Dirt and Red, White and Win also have progressive jackpots waiting to be won. Lincoln Casino welcomes players from around the world. Its most popular games are also available in its new mobile casino including Cleopatra’s Pyramid and the new Cool Bananas mobile slot games.